Conveniently located in Snowmass Village, Colorado and directly on the village shuttle line, The Ridge offers exceptional location, views, amenities, privacy and the convenience of a ski-in ski-out vacation on Snowmass Mountain. Next time youre staying in Snowmass, stay with us in an affordable and luxurious vacation condo. Our condominiums are 2 and 3 bedrooms with all the amenities. Beautiful and luxurious vacation rental homes conveniently located in Snowmass Village, Colorado. 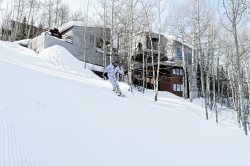 Fully equipped 2-3 bedroom rental homes most with easy ski-in ski-out and exceptional views, all on Snowmass Mountain. Next time youre staying in Snowmass, stay with us in an affordable and luxurious vacation home.